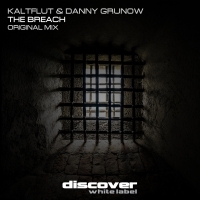 Discover White Label returns in hard as you like fashion, this time courtesy of Kaltflut and Danny Grunow with The Breach. The build is tough and uncompromising pausing for brief respite in the breakdown with a cool trance reprise, before unloading yet more mayhem. A brute of a tune, produced to perfection and delivered in style. 'The Breach' is available now from Beatport and iTunes.